Main research area of this laboratory is a development of communication protocols, (aero-)space onboard networks (SpaceWire, SpaceWire-RUS, GigaSpaceWire, SpaceFibre, etc.) and complex systems for design and simulation of spacecraft onboard networks. The Laboratory for Embedded Computing for Mobile Communications is one of the leading Russian laboratories specializing in SpaceWire protocol development. The EmCoMobile lab develops, updates and works with the SpaceWire for more than 10 years, participating in international conferences. The Laboratory participates in the joint project with the University of Dundee and European Space Agency (ESA). The Laboratory takes part in the development of the Russian national SpaceWire-based standard taking into account the specificity and requirements of Russian space industry. The Laboratory takes part in the development of the specific SpaceWire version that provides gigaspeed data transmission. 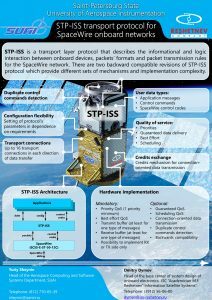 The Laboratory provides complex development of transport protocol STP-ISS for the SpaceWire onboard networks, from gathering of technical requirements to implementation of reference models and hardware-software testing. The protocol has been developed in partnership with JSC ISS (Information Satellite Systems) Academician M.F. Reshetnev. for the Russian space industry. 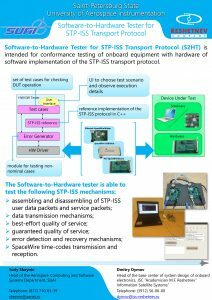 The Laboratory has developed a Workplace for the hardware-software adjustment of SPT-ISS protocol for the functional testing of the onboard equipment with the hardware or software implementation of STP-ISS protocol. 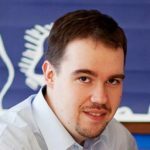 The Laboratory has developed a computer-aided system SANDS – SpaceWire Automated Network Design and Simulation – for the onboard SpaceWire networks in autonomous spacecraft. The system has been developed in partnership with JSC ISS (Information Satellite Systems) Academician M.F. Reshetnev.